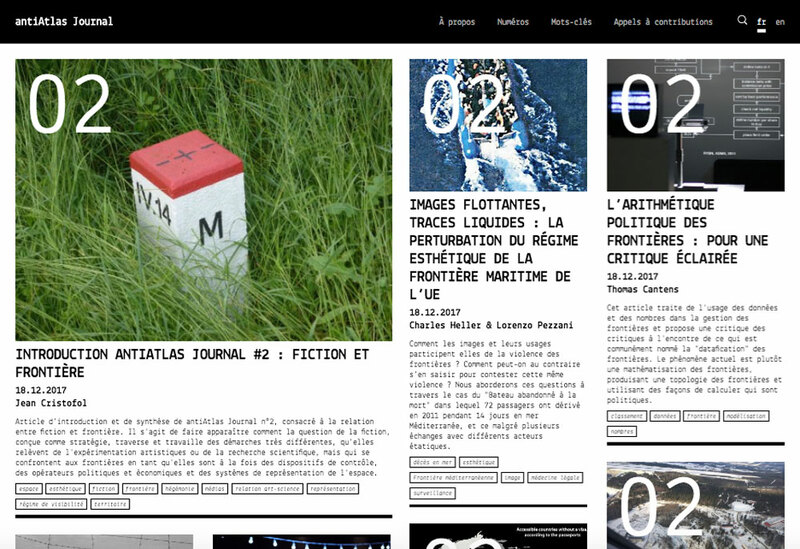 Digital, bilingual and in free access, the antiAtlas Journal opens an exploratory editorial space dedicated to a radical transdisciplinary approach to contemporary borders. As an extension of the antiAtlas of Borders project relying on a collaboration between researchers and artists, it experiments new methods of editing and of modelization of research. The editorial directors are Cédric Parizot, Anne-Laure Amilhat Szary and Jean Cristofol. Its content is available online (desktop, tablets and mobiles) and in PDF format. Published online on 13 April 2016, the first issue, Arts-Sciences Explorations at the Border, brings together articles by Anne-Laure Amilhat Szary, Jean Cristofol, Anna Guilló, Nicola Mai, Sarah Mekdjian and Marie Moreau, and Cédric Parizot and Douglas Edric Stanley. The second issue, Fictions at Frontiers (2017), will provide an account of research and reflections put forward by the antiAtlas of Borders’ collective. Content for later thematic issues will be obtained via calls for papers: the first of these, for antiAtlas Journal n°03, will be published online on 1 June 2016.